When I started blogging on JSR 303 ("Bean Validation"), there was not too much information available on the web concerning the BV API, its usage and its integration with other technologies. In between JSR 303 got approved, BV is part of Java EE 6 and as it generally gains wider adoption, more and more blog posts and other information related to Bean Validation come available. That's why I thought it might be a good idea to collect the most interesting pieces and publish those links here every once in a while. I plan to post follow-ups, whenever I gathered some interesting links, so stay tuned. Recently I received an IntelliJ IDEA code style settings file for Hibernate Validator, the reference implementation of JSR 303 ("Bean Validation"), to which I'm contributing. When working with XML-based web services, it usually a good idea to validate all requests and responses against their associated XML schema in order to ensure the integrity of the incoming/outgoing messages. Unfortunately JAX-WS, the standard API for SOAP-based web services of the Java Platform doesn't specify a standard way for schema validation. Therefore most of the JAX-WS implementations such as Metro or CXF provide a proprietary mechanism to perform that task. This works as expected, but has one big flaw in my eyes: to enable or disable validation for a given endpoint, the application code must be modified, followed by a re-deployment of the application. This is not viable in many scenarios. Taking a large enterprise application with a whole lot of services for example, schema validation might be turned off by default for performance reasons. But for the purpose of bug analysis it might be required to temporarily enable validation for single endpoints. Re-deploying the application is not an option in this scenario. That's why I had a look into Metro's implementation of the validation feature and tried to find a way to make schema validation configurable during runtime. Schema validation in Metro is realized using in form of a so-called "tube". Metro tubes are conceptually similar to JAX-WS message handlers, but a magnitude more powerful. Since Metro 2.0 the tubes to be applied for a given application can be configured by providing so-called custom "tubelines". So the basic idea is to extend the standard validation tube provided by Metro in a way which makes it runtime-configurable and register this customized tube instead of the original one. Note: Before going into details, it should be said that as of Metro 2.0 the tube-related APIs are regarded as Metro-internal APIs, so they could be changed in future versions, causing the approach described here not to work anymore. But as we don't write very much code, this shouldn't really scare us. The important thing here is, that the method isNoValidation() is overridden. This method is defined within the base class AbstractSchemaValidationTube and is invoked whenever a request/response is processed by this tube. The implementation of this method simply delegates to the ValidationConfigurationHolder shown above. Within the constructor an instance of the EndpointConfiguration MBean for the given endpoint is registered with the platform MBean server, which later can be used to toggle validation for this endpoint. The code resembles Metro's instantiation logic for the standard validation tube, the only difference being that a ConfigurableServerSchemaValidationTube is created. Note that we also check whether the SchemaValidationFeature is enabled or not. That way given endpoints can be completey excluded from validation by simply not annotating them with @SchemaValidation. As suggested in a post by Metro developer Marek Potociar it's a good idea to take Metro's standard tube configuration, metro-default.xml, as template and adapt it as needed. In our case the ConfigurableValidationTubeFactory is registered instead of the standard ValidationTubeFactory. Having registered the tube factory, it's time to give the whole thing a test run. A complete project containing all sources of this post together with an examplary video rental web service can be found in my Git repo. 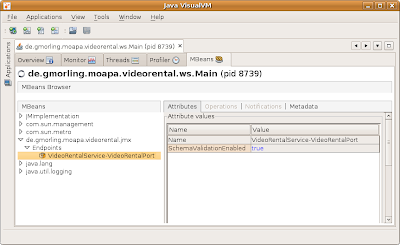 By setting the value of the "SchemaValidationEnabled" property of the MBean named "VideoRentalService-VideoRentalPort", schema validation now can be enabled or disabled for the corresponding endpoint.